The primary focus of economics is the analysis and description of the production, distribution, and consumption of scarce goods and services. Economics is considered a social science because it attempts to explain behavior of individuals, groups and organizations. However, unlike many social sciences, economics is based heavily on math and statistics. In fact, at the college level, most students are required to complete several upper-level math and statistics courses as prerequisites to majoring in economics. Economics also tends to be one of the more challenging subjects for students – especially for those in their first and second year college who didn't study economics in high school. If you have the opportunity to study economics in high school, do so. It will prepare you for more challenging economics courses in college. The first level of academic performance in the study of economics is knowledge. Gaining knowledge consists of learning and remembering specific material, including facts, definitions and explanations. Knowledge type questions require very little, if any, analysis and are typical of high school level economics courses. Notwithstanding, knowledge is the basis of learning and is required in order to progress through other levels of academic performance. The following is an example of a knowledge question. In economics, only about 15-20% of test questions are purely knowledge based at the college level. The second level of academic performance in the study of economics is comprehension. Where knowledge focuses on the acquisition of material, comprehension focuses on grasping the meaning of material. In economics, the primary methods for demonstrating comprehension are (1) converting material from one form into another (e.g. words to numbers), (2) interpreting material (e.g. explaining), and (3) estimating trends (e.g. predicting future effects and implications). Comprehension represents the lowest level of understanding within the scope of economics. The following is an example of a comprehension type question that could appear on an economics test. (a) A decrease in demand for HP computers. (b) A degree in quantity demanded of HP computers. (c) An increase in demand for HP computers. (d) An increase in the quantity demanded of HP computers. ANSWER: C. An increase in demand for HP computers. About 30-40% of the test questions you'll find on college-level economics tests will be comprehension. The third level of academic performance in the study of economics is application. Once students have obtained knowledge and comprehension of economic concepts, principles, laws, and theories, they're expected to use and apply material in real world situations. An example of a application type question that could appear on an economics test includes the following. 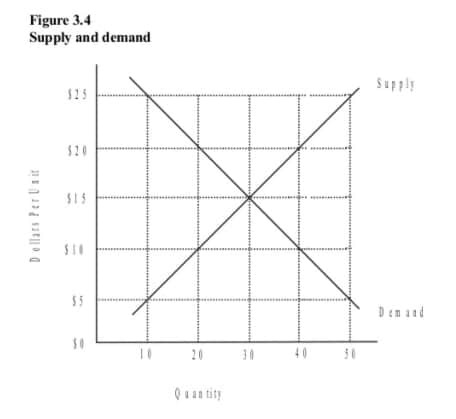 (b) Direct relationship between price and quantity demanded. (d) Indirect relationship between price and quantity supplied. ANSWER: A. Law of demand. At the college level, about 30%-50% of test questions are application. Analysis is the fourth and final level of academic performance with respect to the study of economics. Analyis is the ability to break down material (including economic theory) into its individual components in order to gain a better understanding of its overall organizational structure. Analysis typically entails (1) identification of parts, (2) gaining an understanding of the relationship(s) between parts, and (3) being able to identify the organizational principles and laws involved. An example of an analysis type economics test question might include the following. (a) A shortage of 20 units would occur. (b) A surplus of 20 units would occur. (c) A shortage of 10 units would occur. (d) A surplus of 10 units would occur. ANSWER: A. A shortage of 20 units would occur. Analysis questions typically make up about 10-15% of test questions in upper level economics courses. Even though economics is a social science, it can be as difficult and demanding as any of the more challenging academic subjects, including math, chemistry, etc. To do well in economics requires time, dedication, and good study habits. The following are study strategies, techniques and habits for success in learning economics. Prepare assignments before attending class. It's very important to arrive at each class having already completed assignments. Preparing assignments BEFORE class will allow you to ask appropriate questions and understand the lecture. Your professor will most likely not cover all the assigned material presented in your text. He will cover more complex economic theories and applications in class and will expect you to ask for clarification on anything in the text or your assignment that you didn't understand. As you read your economics text, read for understanding. Start by spending 10-15 minutes reading any outline or summary provided for the assigned chapter. Try to identify and remember the main points of the chapter. Next, read the introduction. The introduction usually provides a quick summary of the topics being covered and lists chapter objectives. Read each topic one at a time. Make sure you understand the relationship between each topic in the chapter. Most topics will be presented verbally, numerically (tables), and visually (graphs). It's importance to understand the information presented within each context since all three communication modes are used in economics and are likely to be employed in presenting test questions. After reading each topic, you should be able to (1) remember the topic and important terms, (2) understand the material presented, (3) relate relevant terms to one another, and (4) relate each topic to the other topics covered in the chapter. Attend all lectures and classes. Economics is such a demanding course that you can't afford to miss class. Much of the information, understanding and help you'll need to get through your economics course will come directly from your professor through his lectures. Don't think you can miss class, copy our friends notes, and sail through economics. It won't happen. Master material as you go. Economics is much like math in that it is a cumulatively acquired subject. Gaining understanding in economics requires cumulative learning. Mastering what you learned in class last week is necessary in order to understand what the professor and text are presenting today. If you fall behind in your studies, it becomes increasingly difficult to understand the new principles and concepts being introduced and covered. You must master each new concepts in terms of knowledge, comprehension and application before you can master new material. Consequently, "cramming" simply does not work for studying economics and preparing for exams. Don't take good notes... take the right type of notes. There simply isn't enough time to write down everything your professor says during lecture while concentrating on what is being taught. Your time in class should be dedicated to comprehending and applying the economic concepts and principles being presented. The only way to make this happen is to arrive at each lecture (1) having completed all readings and assignments and (2) with a basic understanding of the topics being discussed. The notes you take in class should not include everything your professor says. They should not include definitions and concepts that you already understand or that are covered in detail in your text. Your notes should supplement what you have already learned from your own study and clarify anything you don't quite understand. Be very selective in what you include in your notes. Employ the "four" classroom behaviors. Using class time to improve your ability to comprehend and apply economic concepts requires the careful combination of four classroom behaviors – (1) listening, (2) asking questions, (3) responding to questions, and (4) taking notes. In order to listen and ask questions, you must come to class prepared. If you arrive a class unprepared, you won't have the basic knowledge and understanding required to follow along and comprehend. Without some level of comprehension you won't be able to ask or answer questions that lead to a better comprehension. Finally, take notes that clarify and supplement your knowledge of the concepts being discussed.